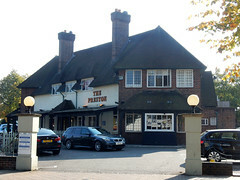 Ember Inns pub in North Wembley. It's a fairly standard Ember Inn, with several different areas inside, plenty of seating, brickwork "feature walls", coordinated upholstery, and the same general feel of having been designed to be as inoffensive as possible. There's a beer garden out the back with grass and picnic benches. Kake visited on a Friday afternoon in October 2015. There were quite a few people in when I arrived around 2:30pm, many of them just finishing lunch. Music was playing quietly. The handpumps were clipped for Brakspear Bitter, St Austell Tribute, and Brains The Rev James; there was also a note saying that Sharp's Doom Bar was coming soon. A pint of lime and soda was free! Service was friendly, too. Food is served all day from a chain-wide menu of fairly standard pub food including a handful of vegetarian options. There's free WiFi via O2 (requires registration, possibly via text message). Child-friendliness: They have at least four highchairs (the type without trays and very little back support), and there's a pull-down nappy change table in the accessible toilet. Accessibility: No step to get in at the main entrance. Step-free to most (possibly all) of the interior seating, the toilets (including an accessible one), and part of the beer garden. The pub has a pay-and-display car park, and apparently you can redeem some (or possibly all) of the cost at the bar. Last visited by Kake, October 2015. Opening hours taken from the Ember Inns website, October 2015. Page last edited 2015-10-07 17:29:06 (version 1).